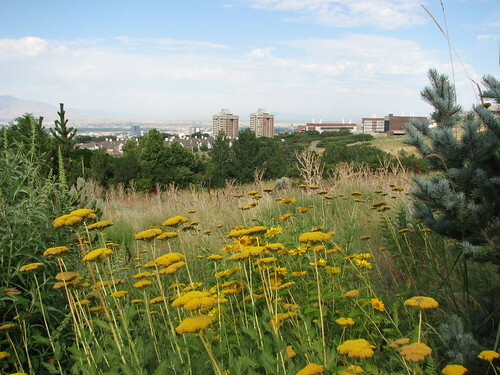 I spent the last week of July in Salt Lake City and the Wasatch Mountains. First was the Botany & Mycology Conference at Snowbird where I did my first conference talk, a terrifying and humbling experience that went more or less well. :/ It was gratifying to know that there are other people out there who think Tilia phylogeography is worth learning about! After the conference, my husband met me there for a few days of hiking and sightseeing. He knows the area well but only as it appears in winter, so seeing it in summer was a new experience for him, and I had never been there before. The mountains were gorgeous, with hidden lakes, amusing native Wasatch squirrels ("potguts"), and stunning vistas of alpine flowers around every corner. First up: Little Cottonwood Canyon, including Alta and Snowbird ski areas and hikes to Germania Pass and Lake Catherine. 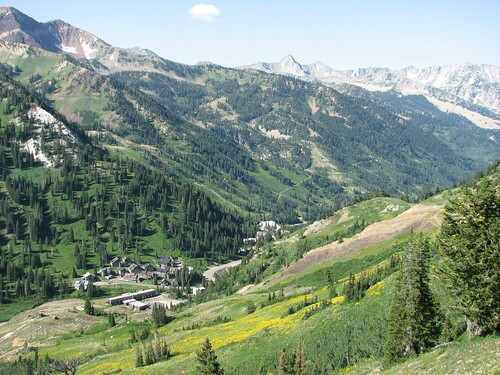 Next: Big Cottonwood Canyon, the next canyon to the north, where we stayed at Silverfork Lodge and hiked to Donut Falls and Twin Lakes Reservoir. In about an hour I head out the door to what is hopefully my final collecting trip for the ol' dissertation. I will be gathering basswood samples in upstate New York, then visiting the Harvard Herbaria to photograph and observe samples from North America and worldwide. The travels have been fun but I'm kind of looking forward to staying home for a good long while. Wow, the scenery is gorgeous! And don't worry, public presenting gets better over time and you'll get to a point where it won't even make you too nervous! Tilia are lindens (basswood), right? Had to Google phylogeography--it sounds interesting! Can you do a post on what you've found in layperson's terms? I have to ditto Monica, the scenery is beautiful and some blogging about phylogeography would be appreciated by me too.